Biphasic defibrillation waveforms are now accepted as being more effective at terminating ventricular fibrillation (VF) than monophasic waveforms. If two phases are better than one, this naturally leads to the hypothesis that additional phases improve efficacy. This study tests the hypothesis by adding one additional phase. We examined the efficacy of 18 different triphasic waveforms simultaneously. We tested the rate of recovery, i.e., successful defibrillation, of 21 guinea pigs (820-1,050 g) using triphasic, monophasic and biphasic defibrillation waveforms. The biphasic and monophasic were control waveforms. VF was electrically induced twenty times per animal and a single defibrillation attempt was made using a test waveform VF episode. Every waveform was adjusted to the energy required to defibrillate that animal 50% of the time, using a biphasic waveform as a control. 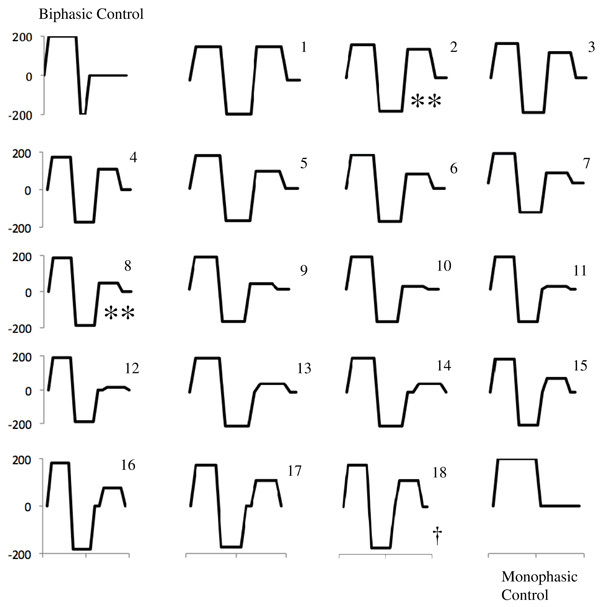 The success rate of each triphasic waveform was pair-wise compared to the biphasic and monophasic control using the adjusted McNemar statistical test. Of the 18 triphasic waveforms tested, two were significantly poorer than the monophasic control (p<0.05). One was superior to the biphasic waveform (p<0.1), but not statistically so. We concluded that, while adding a phase to a monophasic waveform does improve efficacy, adding an additional phase to a biphasic waveform does not necessarily improve efficacy. Keywords: Triphasic waveforms, defibrillation efficacy, defibrillation waveforms, defibrillators..
© Davis and Malkin; Licensee Bentham Open. Throughout the United States, over a million people die each year, as a result of sudden cardiac death, sometimes called a massive heart attack or ventricular fibrillation (VF). Defibrillation, a strong electrical shock, delivered very soon after the onset of VF can save the patient. For this reason, most airplanes, stadiums and police cars are now equipped with automatic external defibrillators. One of the reasons that defibrillators can be made small and effective enough to warrant such wide distribution is the advent of the biphasic waveform. Initial defibrillators delivered a highly polyphasic, 60 Hz stimulus to the heart [1Geddes L A, and Havel W, "“Evolution of the optimum bidirectional (±biphasic) wave for defibrillation,”", Biomed. Instrum. Tech, vol. 34, pp. 39-54, 2002.]. This resulted in occasional, but rare termination of VF. The truncated, monophasic waveform (see Fig. 1 ) was soon introduced, dramatically improving the efficacy of defibrillation [1Geddes L A, and Havel W, "“Evolution of the optimum bidirectional (±biphasic) wave for defibrillation,”", Biomed. Instrum. Tech, vol. 34, pp. 39-54, 2002.]. Early work by Schuder et al. demonstrated that the addition of another phase creates the biphasic waveform and further improves efficacy for the same delivered energy [2Flaker G C, Schuder J C, McDaniel W C, Stoeckle H, and Dbeis M, "“Superiority of biphasic shocks in defibrillation of dogs by epicardial patches and catheter electrodes,”", Am. Heart J. vol, vol. 118, no. 2, pp. 288-91, 1989.]. As a result, most modern defibrillators use the biphasic waveform. There has been significant discussion of waveform efficacy [3Block M, and Breithardt G, "“Optimizing defibrillation through improved waveforms,”", Pacing Clin. Electrophysiol, vol. 18, no. 3 Pt 2, pp. 526-38, March 1995.] including some detailed study of triphasic waveforms [4Kidwai B J, Mcintyre A, Anderson J, and Adgey AA, "“Optimization of transthoracic ventricular defibrillation-biphasic and triphasic shocks, waveform rounding, and synchronized shock delivery,”", J. Electrocardiol, vol. 35, no. 3, pp. 235-44, July 2002.]. But, the work that has been done has been severely limited by the number of waveforms that could be simultaneously investigated, typically one biphasic compared to one triphasic. Here we present the first study of many triphasic waveforms simultaneously tested against one another and a biphasic control. This research seeks to answer the question, would adding another phase to a biphasic pulse improve defibrillation efficacy. All animal experiments were approved by the animal care and use committee at the University of Memphis. Twenty-one male, guinea pigs, between 820 and 1050 g, were anesthetized with intraperitoneal propofol (1,000 mg/kg) [5Malkin R A, Guinn R, and Mandrell T, "“Water soluble propofol anesthesia: An effective and inexpensive alternative,”", Lab. Animal, vol. 29, pp. 45-7, 2000.]. Direct laryngeal intubation or a tracheotomy was performed to provide positive pressure ventilation with room air and oxygen. The heart rate, ECG, oxygen saturation, and plethysmograph were continuously monitored and recorded, and a homeothermic blanket maintained the rectal temperature near 38ºC (Harvard Apparatus Inc., Holliston, MA, USA). For the induction of ventricular fibrillation we introduced an esophageal electrode, consisting of a 0.5 mm-diameter copper wire enclosed in a 0.7 mm-diameter silicone tube. The counter electrode was a blunted needle passed through the diaphragm toward the ventricular apex. Defibrillation electrodes were 12 mm discs placed subcutaneously at the level of maximum impulse on opposite sides of the sternum. Every defibrillation waveform was digitized in 1-ms increments and then converted to an analog signal through a 12-bit D/A card (PCI 1200; National Instruments, Corp., Austin, TX, USA). The analog signal was amplified through a high voltage amplifier (Bipolar Operational Source/Sink, Electronic Measurements Incorporated). We have previously shown that this electronic configuration reproduces the intended defibrillation voltage to within a few percent [6Malkin R A, Jackson S R, Nguyen J, Yang Z, and Guan D, "“Experimental verification of theoretical predictions concerning the optimum defibrillation waveform,”", IEEE Trans. Biomed. Eng, vol. 53, no. 8, pp. 1492-8, Aug 2006.]. A control pulse (1-ms, monophasic) was delivered to a dummy load and to the animal in normal sinus rhythm to verify the wiring and calibrate the digital to analog conversion and amplification. A graphical multimeter (Fluke 123 Scopemeter; Fluke Corp., WA, USA) was used to record and verify the voltage and current waveforms delivered by the defibrillator for every stimulus. Ventricular fibrillation (VF) was induced by 60Hz, AC stimulation (< 1s). VF was confirmed by a polymorphic rhythm on the ECG and the absence of a pulse on the optical plethysmograph. Two seconds of VF were allowed to pass before defibrillation was attempted. Successful defibrillation was determined by the return of a regular ECG rhythm and a pulse on the optical plethsymograph and the rhythm eventually resolved to a normal sinus rhythm. If the test waveform failed to defibrillate, a backup shock (200 V, 7 ms first phase, 2 ms second phase) was delivered. Three minutes were left between every fibrillation episode, or longer, if required for the animals’ oxygen saturation to fully recover. The ten-step Bayesian protocol was used to determine the ED50 (50% successful defibrillation strength) for the biphasic control waveform [7Compos A T, Malkin R A, and Ideker R E, "“A Bayesian up-down defibrillation efficacy estimator,”", Pacing Clin. Electrophysiol, vol. 20, pp. 1292-1300, 1997.]. The strength in joules of all of the remaining test waveforms was normalized to contain as much energy as the ED50 for the biphasic waveform (the normalized stimulus strength). Durations and voltages for eighteen triphasic waveforms were selected randomly, roughly following our previously described methodology [8Guan D, and Malkin R A, "“Analysis of the Defibrillation Efficacy for 5-ms Waveforms,”", J. Cardiovasc. Electrophysiol, vol. 15, pp. 447-54, 2004.]. Our methodology maximizes the coverage of the triphasic waveform possibilities and removes investigator bias from the selection of the waveforms. Each of the eighteen triphasic test waveforms and the two control waveforms were delivered to the animal at the normalized stimulus strength. Each waveform was tested once in a random order. All tested waveforms were categorized as either a success or failure. Statistical tests were carried out with the Modified McNemar Test [9Malkin R A, "“An unconditional exact test for small samples of matched binary pairs,”", J. Modern App. Stat. Methods, vol. 1, no. 1, pp. 69-73, 2002.]. The McNemar test statistic (Z) is a pair-wise, relative figure of merit for the performance of a test wave form as compared to the control waveform on an animal-by-animal basis. The McNemar analysis is based on discordant pairs, that is pairs where the test succeeds and the control fails (s/f discordant pair) and pairs where the test fails and the control succeeds (f/s discordant pairs). Concordant pairs (s/s and f/f) are ignored in a McNemar analysis. The p-value indicates significance, either better or worse, in our situation below 0.05 when Z exceeds 3.83 and below 0.10 when Z exceeds 2.70. The results are summarized in Fig. (1 ). Two triphasic waveforms were statistically significantly worse than the monophasic control (p<0.05). One showed discordant pairs of 0 s/f and 5 f/s (Z=7.2), meaning that zero triphasic defibrillation attempts with this waveform succeeded in an animal when the monophasic failed and five times the test triphasic failed when the monophasic control succeeded. The second significantly worse triphasic showed 2 s/f and 7 f/s (Z=4.0). Only one triphasic waveform showed superior performance to the biphasic control (p<0.10). The other 17 triphasic waveforms proved inferior to the biphasic control. However, the one superior triphasic waveform showed 7 s/f and 1 f/s, a notably better performance than the biphasic waveform, though not statistically significant. The Lowen and truncated, monophasic waveforms started the modern era of defibrillators [1Geddes L A, and Havel W, "“Evolution of the optimum bidirectional (±biphasic) wave for defibrillation,”", Biomed. Instrum. Tech, vol. 34, pp. 39-54, 2002.]. Consequently, the addition of a second phase to the monophasic waveform dramatically increased the efficacy of the waveform [1Geddes L A, and Havel W, "“Evolution of the optimum bidirectional (±biphasic) wave for defibrillation,”", Biomed. Instrum. Tech, vol. 34, pp. 39-54, 2002.]. Therefore, it is logical to ask if the addition of a third phase, making a triphasic waveform could further improve efficacy. Of all the triphasic waveforms we tested, most were worse than the original monophasic waveform. Two were statistically significantly worse than the monophasic waveform. Only one was better than the biphasic but it was not statistically significantly better. This is consistent with in vitro findings showing that there is no statistically significant difference in the stimulation threshold of cells between triphasic and biphasic waveforms [10Jones J L, and Jones R E, "“Improved safety factor for triphasic defibrillator waveforms,”", Circ. Res, vol. 64, no. 6, pp. 1172-7, Jun 1989.]. The one waveform that showed promise, i.e., #18 (Fig. 1 ), provided an 86% rate of successful rescue from VF as compared to the 57% success rate for the biphasic control. This might have been statistically significant, had the sample size been larger. Our data does contradict some other findings, including some investigations having found evidence of better defibrillation with triphasic waveforms. For example, in an open-chest pig model, one triphasic waveform was found to be superior to a biphasic waveform [11Zhang Y, "“Surgical open-chest ventricular defibrillation: triphasic waveforms are superior to biphasic waveforms,”", Pacing Clin. Electrophysiol, vol. 27, no. 7, pp. 941-8, Jul 2004.]. Likewise, White showed that long duration VF was better terminated by a triphasic waveform [12White R D, "“Waveforms for defibrillation and cardioversion: recent experimental and clinical studies,”", Curr. Opin. Crit. Care, vol. 10, no. 3, pp. 202-7, Jun 2004.]. However, the contradiction may be explained if the effect of triphasic waveforms was heavily influenced by subtle changes in experimentation. For example, in the same study by White et al. cited above, they showed that short duration VF was better terminated by biphasics [12White R D, "“Waveforms for defibrillation and cardioversion: recent experimental and clinical studies,”", Curr. Opin. Crit. Care, vol. 10, no. 3, pp. 202-7, Jun 2004.]. Quadriphasics show superior performance but only when the patient’s impedance is elevated [13Zhang Y, "“Quadriphasic waveforms are superior to triphasic waveforms for transthoracic defibrillation in a cardiac arrest swine model with high impedance,”", Resuscitation, vol. 68, no. 2, pp. 251-8, Feb 2006.]. Polarity may also affect the relative efficacy of triphasic waveforms [14Huang J, Kenknight B H, Rollins D L, Smith W M, and Ideker R E, "“Ventricular defibrillation with triphasic waveforms,”", Circulation, vol. 101, no. 11, pp. 1324-8, Mar 21, 2000.]. Thus, triphasics may indeed be superior in some models or under certain conditions but based on our findings and the body of evidence, we conclude that triphasic waveforms cannot be considered uniformly superior to biphasic waveforms. One of the advantages of our experimental approach is that we can compare multiple triphasic waveforms simultaneously allowing us to draw deeper conclusions in some cases than simple one-to-one comparisons. We wanted to investigate why increasing the number of phases appears to generally reduce efficacy? One hint at the answer may be deduced by comparing the triphasic waveforms in this study. Even waveforms with very small third phases, such as waveform #18 in Fig. (1 ), did not provide a statistically significant improvement. While this could be interpreted as reducing the probability of defibrillation, failed defibrillation has been described as the reinitiation of fibrillation (upper limit of vulnerability hypothesis [15Malkin R A, and Souza J J, "“Ideker RE The ventricular defibrillation and upper limit of vulnerability dose-response curves,”", J. Cardiovasc. Electrophysiol, vol. 8, no. 8, pp. 895-903, Aug 1997.]). Further insight into this phenomenon could be obtained by computer simulation but we can speculate from our data. If simply adding a phase to a biphasic pulse does not improve defibrillation, and may even make things worse, why does adding a phase to a monophasic pulse improve defibrillation efficacy. In other words, why are biphasic pulses better than monophasic pulses if not because of an added pulse? One possibility is suggested by one of our earlier papers [16Malkin R A, Guan D, and Wikswo J, "“Experimental Evidence of Improved Transthoracic Defibrillation Consistent with Electroporation,”", IEEE Trans. Biomed. Eng, vol. 53, no. 10, pp. 1901-11, 2006.]. In that work, we showed that a strong, very brief, stimulus given before a monophasic pulse improved the efficacy of defibrillation. The short pulse probably improved efficacy by inducing electroporation [16Malkin R A, Guan D, and Wikswo J, "“Experimental Evidence of Improved Transthoracic Defibrillation Consistent with Electroporation,”", IEEE Trans. Biomed. Eng, vol. 53, no. 10, pp. 1901-11, 2006.]. This improvement was independent of the phase of that pulse. In other words, whether the short and long pulses created a monophasic or biphasic defibrillation shock, efficacy was improved by the presence of the short stimulus. We may be able to extrapolate that the biphasic pulse is more efficacious because it contains a transition, from say +800 to -800 volts, or 1600 volts, larger than an equivalent energy monophasic pulse which would only create two 800 volt transitions (one positive and one negative). This could also explain why separating the two phases of a biphasic pulse reduces efficacy. To summarize, an 800 V, 16-ms monophasic pulse may be less efficacious than a +800V/-800V 8ms/8ms biphasic pulse because the 1600 V transition in the middle of the biphasic pulse causes electroporation which increases the ability of the following 8-ms monophasic pulse to defibrillate. However, while some of the data presented here does support this notion. Some of the waveforms were less efficacious despite the presence of significant transitions. This could be the role of the third phase reinitiating fibrillation but this study is not sufficient to separate these causes. No matter the mechanism, adding a third phase to a biphasic pulse may not necessarily improve efficacy and probably will reduce efficacy. 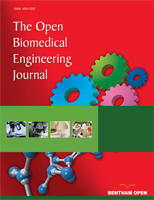 Geddes L A, and Havel W, "“Evolution of the optimum bidirectional (±biphasic) wave for defibrillation,”", Biomed. Instrum. Tech, vol. 34, pp. 39-54, 2002. Flaker G C, Schuder J C, McDaniel W C, Stoeckle H, and Dbeis M, "“Superiority of biphasic shocks in defibrillation of dogs by epicardial patches and catheter electrodes,”", Am. Heart J. vol, vol. 118, no. 2, pp. 288-91, 1989. Block M, and Breithardt G, "“Optimizing defibrillation through improved waveforms,”", Pacing Clin. Electrophysiol, vol. 18, no. 3 Pt 2, pp. 526-38, March 1995. Kidwai B J, Mcintyre A, Anderson J, and Adgey AA, "“Optimization of transthoracic ventricular defibrillation-biphasic and triphasic shocks, waveform rounding, and synchronized shock delivery,”", J. Electrocardiol, vol. 35, no. 3, pp. 235-44, July 2002. Malkin R A, Guinn R, and Mandrell T, "“Water soluble propofol anesthesia: An effective and inexpensive alternative,”", Lab. Animal, vol. 29, pp. 45-7, 2000. Malkin R A, Jackson S R, Nguyen J, Yang Z, and Guan D, "“Experimental verification of theoretical predictions concerning the optimum defibrillation waveform,”", IEEE Trans. Biomed. Eng, vol. 53, no. 8, pp. 1492-8, Aug 2006. Compos A T, Malkin R A, and Ideker R E, "“A Bayesian up-down defibrillation efficacy estimator,”", Pacing Clin. Electrophysiol, vol. 20, pp. 1292-1300, 1997. Guan D, and Malkin R A, "“Analysis of the Defibrillation Efficacy for 5-ms Waveforms,”", J. Cardiovasc. Electrophysiol, vol. 15, pp. 447-54, 2004. Malkin R A, "“An unconditional exact test for small samples of matched binary pairs,”", J. Modern App. Stat. Methods, vol. 1, no. 1, pp. 69-73, 2002. Jones J L, and Jones R E, "“Improved safety factor for triphasic defibrillator waveforms,”", Circ. Res, vol. 64, no. 6, pp. 1172-7, Jun 1989. Zhang Y, "“Surgical open-chest ventricular defibrillation: triphasic waveforms are superior to biphasic waveforms,”", Pacing Clin. Electrophysiol, vol. 27, no. 7, pp. 941-8, Jul 2004. White R D, "“Waveforms for defibrillation and cardioversion: recent experimental and clinical studies,”", Curr. Opin. Crit. Care, vol. 10, no. 3, pp. 202-7, Jun 2004. Zhang Y, "“Quadriphasic waveforms are superior to triphasic waveforms for transthoracic defibrillation in a cardiac arrest swine model with high impedance,”", Resuscitation, vol. 68, no. 2, pp. 251-8, Feb 2006. Huang J, Kenknight B H, Rollins D L, Smith W M, and Ideker R E, "“Ventricular defibrillation with triphasic waveforms,”", Circulation, vol. 101, no. 11, pp. 1324-8, Mar 21, 2000. Malkin R A, and Souza J J, "“Ideker RE The ventricular defibrillation and upper limit of vulnerability dose-response curves,”", J. Cardiovasc. Electrophysiol, vol. 8, no. 8, pp. 895-903, Aug 1997. Malkin R A, Guan D, and Wikswo J, "“Experimental Evidence of Improved Transthoracic Defibrillation Consistent with Electroporation,”", IEEE Trans. Biomed. Eng, vol. 53, no. 10, pp. 1901-11, 2006.